This is the first of two shaker cards I made. 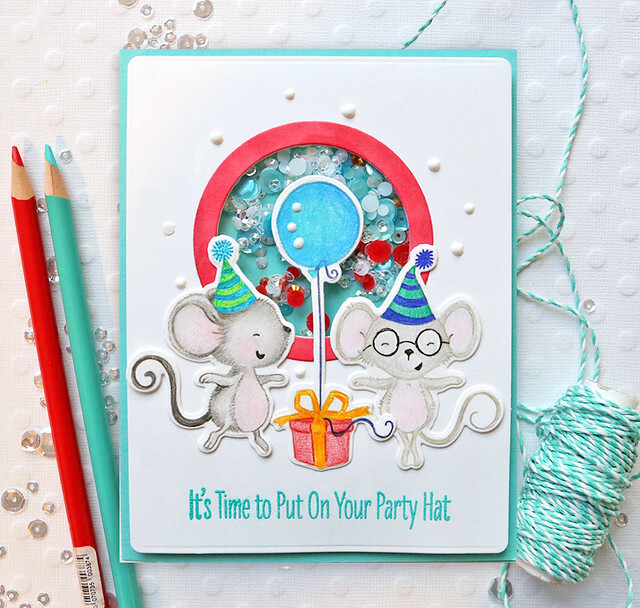 I used the MFT Mini Circle Shaker die for this one. I die-cut it out of white cardstock and then colored the circle frame with Copic Markers. I used a turquoise card base. I put turquoise and clear sequins in and white and red jewels in it. 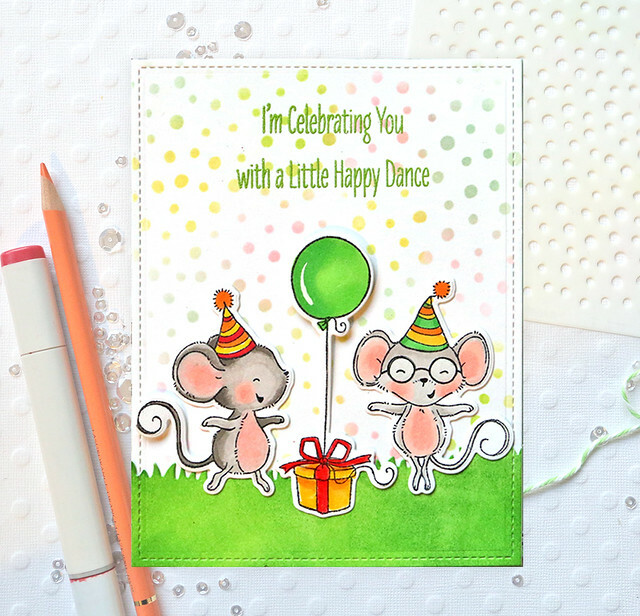 I stamped these cute little mice on white cardstock with MfT Natural Ink and then colored them in with colored pencils. I attached them to the bottom of the shaker window. I used Wendy Vecchi Garden Patina embossing powder for the sentiment on the bottom of the card. I added some white Nuvo Drops around the shaker window. I started this card with a white cardstock large stitched rectangle. I then die-cut a grassy border using the MFT Grassy Hills die out of white cardstock. I then rubbed Mowed Lawn and Twisted Citron Distress Ink over it. I added dots to the white stitched rectangle using the MFT Snow Flurry Stencil. I rubbed several colors of Distress Ink over it including Lemonade, Twisted Citron, Tumbled Glass, and Spun Sugar. 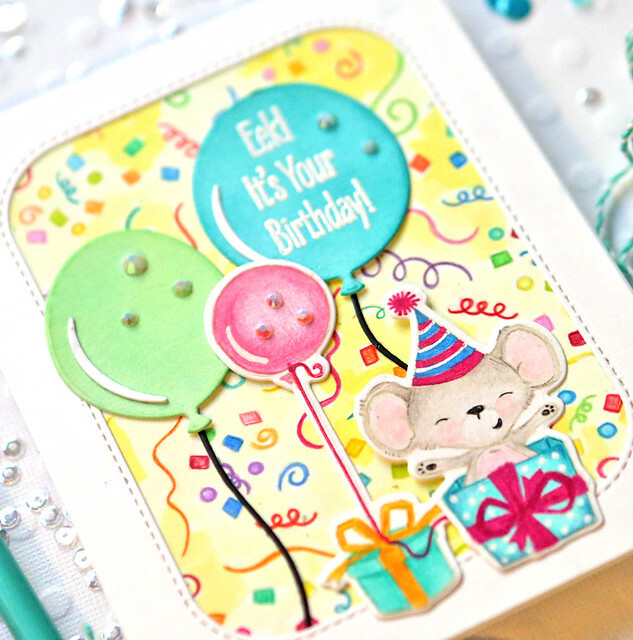 I stamped the sentiment on the top of the rectangle with Leaf Green embossing powder. I stamped the mice images with black ink and colored them in with Copic markers. I attached them over the background. I used foam tape behind the balloon so it was more dimensional. As I have previously mentioned, my step-daughter is an artist and she lives with me. She loves to color, so she colors some of my background stamps just for fun. And then I get to use them for cards - yippee. This one is called the Poinsettia cling rubber stamp. She colored it in with Copic markers. I thought it would be a perfect background for a birthday card. I die-cut it with a large rectangle and attached it to a white card base. I die-cut a rounded stitched rectangle from white cardstock to use behind my images so they wouldn't get lost on the busy background. 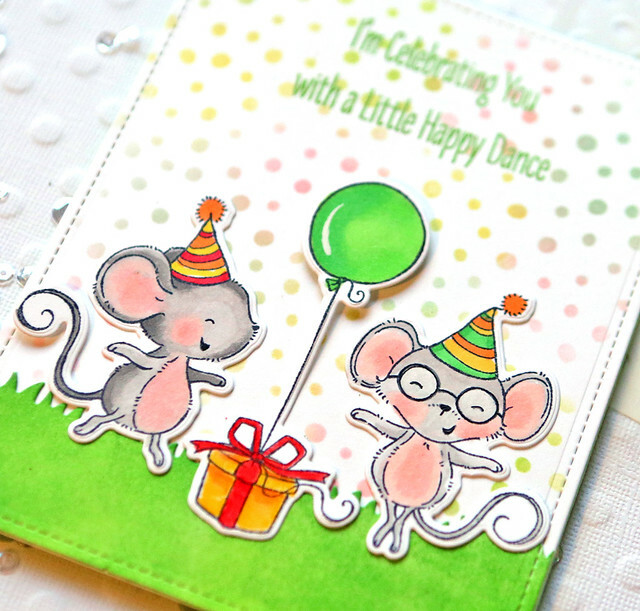 I stamped the mice and balloon/gift with black ink on white cardstock and colored them in with Copic markers. I then attached the small rounded rectangle to the background and attached the stamped images over it. I die-cut three of the MFT Happy Birthday dies from white cardstock and glued them together. I then attached those to the top of the card. I added some red Tonic Nuvo Drops around the images on the white rectangle. 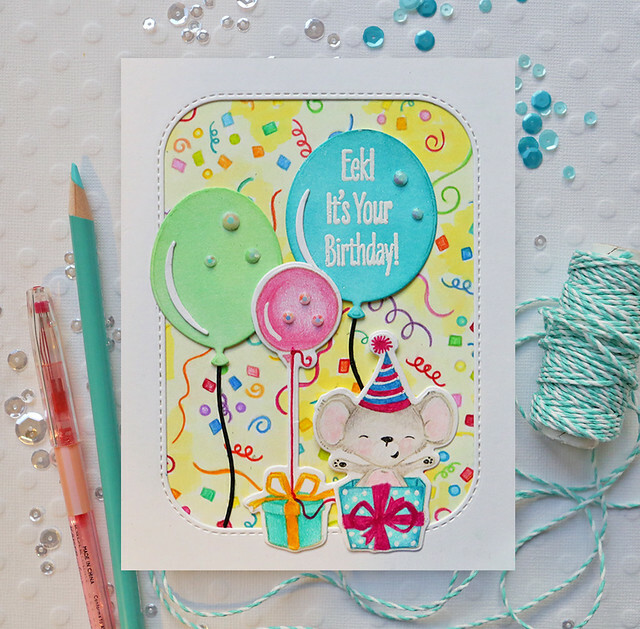 I made the background for this card using the Piñata Party stamp set by Pretty Pink Posh. 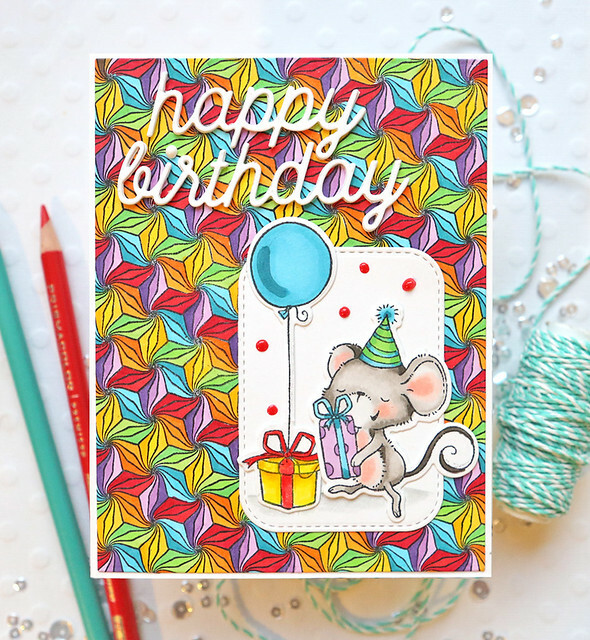 I stamped all of the confetti images with MFT Natural Ink on white cardstock. I outlined them with colored pencils. I also colored the yellow background using colored pencils. I attached a frame over it using white cardstock and the same MFT Rounded rectangle dies I used on the last card. I stamped two balloons from the MFT Birthday Balloons die set and rubbed them with Ranger Distress Inks - I used Cracked Pistachio on one and Peacock Feathers on the other. 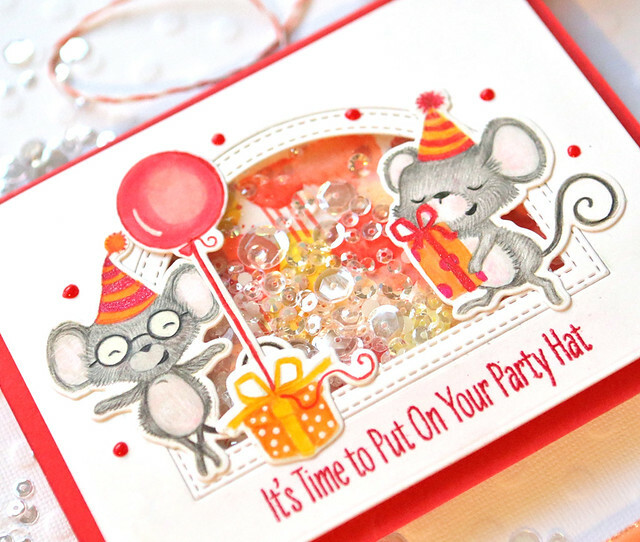 I then embossed the sentiment from the stamp set on the larger balloon with Ranger white embossing powder. 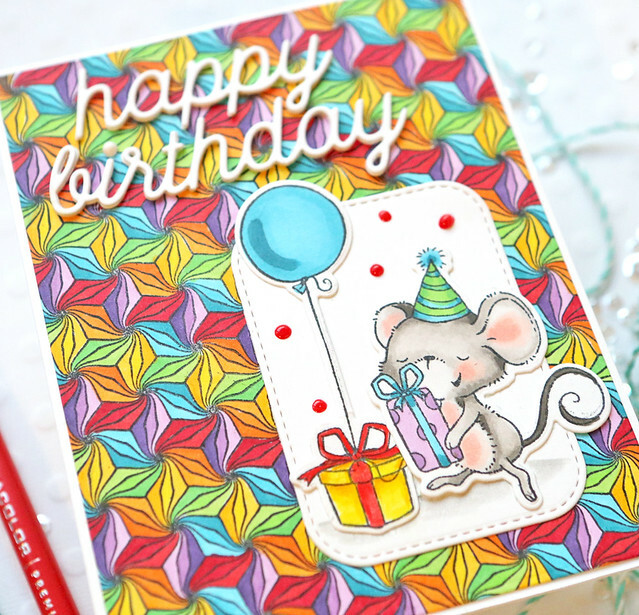 I stamped the stamps from the stamp set with MFT Natural Ink on white cardstock. I colored them all in with colored pencils. I added some details with Kasier Craft glitter pens (my favorite gel pens). I attached all of the items to the card background. I used white jewels over the balloons to finish the card. This is my second shaker card. This time I used the MFT Stitched Dome Frame dies for the shaker opening die-cut from white cardstock. Behind the shaker window, I painted a piece of white watercolor paper with orange, yellow, and red dots and stripes with watercolor. Inside the shaker, I used white and clear jewels, sparkling clear sequin mix and 3mm sparkling clear sequins by PPP. 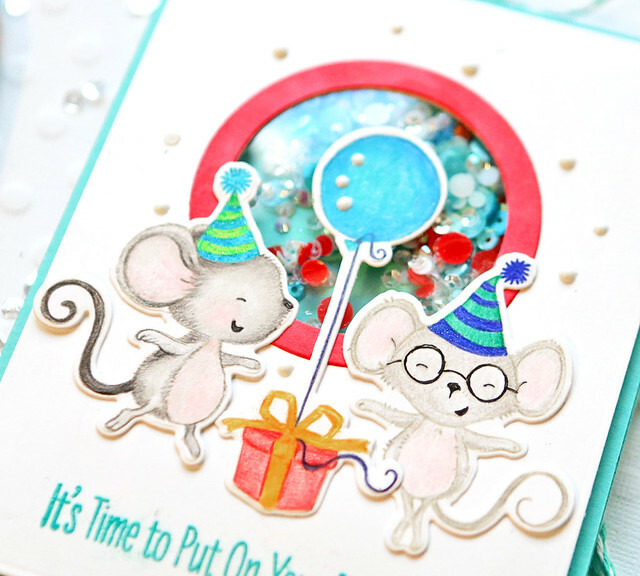 I stamped the mice with MFT Natural Ink and colored them in with colored pencils. I attached them to the outside of the shaker window. 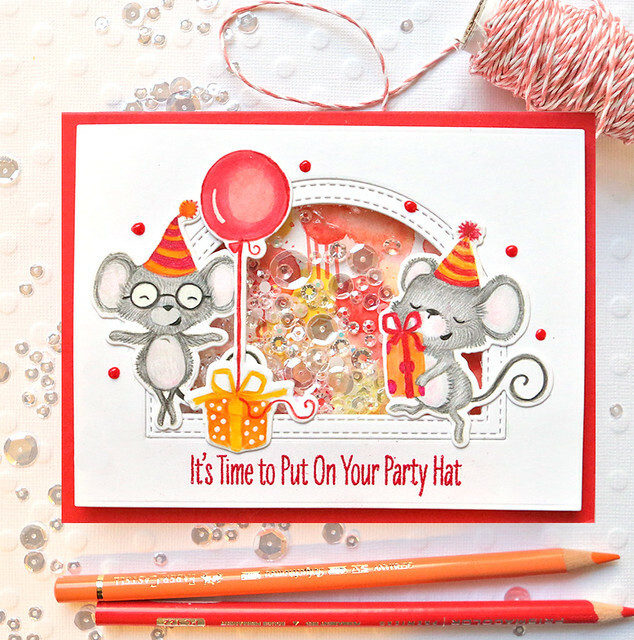 I then embossed the sentiment with Wendy Vecchi Red Geranium embossing powder. I added some red Tonic Nuvo Drops around the frame. All of your cards are fabulous! Happy Birthday to you!